Hideaway Bins offer an efficient and practical solution for kitchen waste disposal and recycling in a completely concealed design. Hideaway Bins deliver a discreet system for modern kitchen designs that are based on clean lines and efficient use of space. Designed to slide under the bench and remain completely hidden from view until needed, a Hideaway Bin is both ergonomic and functional. Mounted at bench height, the bin can simply be pulled out for easy disposal of waste without having to bend inside low cupboards. 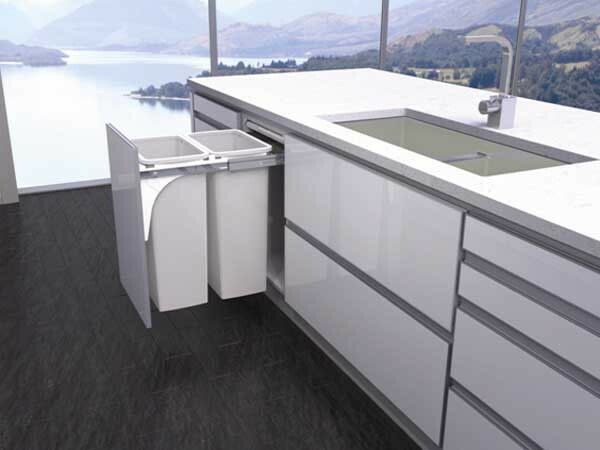 Hideaway Bins are also available in floor mount models for kitchens with provision for under-the-sink installations. A cleverly designed New Zealand Made product, the Hideaway Bin has a high quality and hygienic construction featuring a metal frame made from zinc treated steel, powder-coated for extra durability; buckets made from recyclable, food grade polypropylene plastic; liner holder to hold the bag in place; friction-fitted lid designed to remain inside the cupboard when the bin is in use to keep odours locked away; and Clinikill antibacterial lid to fight harmful bacteria, yeast and fungi. Hideaway Bins are additionally available as a multiple bin solution featuring single or double 15, 20 or 40-litre buckets and a single 50-litre bucket. Designed for easy cleaning and maintenance, Hideaway Bins deliver a simple and efficient solution for sorting waste and recycling in the kitchen.